Sintering of iron ore is a generic term which is used to describe the process whereby a sinter mix (raw mix or green mix) of iron ore fines, fluxes, fuel (coke breeze) and plant return fines (e.g. mill scale, blast furnace dust, and returned sinter fines etc.) are converted into a particular form of agglomerate. It consists of heating the sinter mix with a particle size of less than 10 mm to such a temperature that surface of each grain of the charge mix starts to melt and the formed melt creates liquid bridges between grains, which, after solidification, ensure formation of a solid porous material called sinter having a screened size normally of 5 mm to 30 mm (upper size can go upto 50 mm to suits local requirements), and which can withstand operating pressure and temperature environment inside the blast furnace (BF). The process of sintering is a thermal operation involving melting and assimilation reactions. The first stage of the sintering process is the formation of the melt which involves the reaction between fine iron ore particles and fluxes. The initial melt is generated from adhering fines during heating via reaction between iron ore and fluxes. Then, nucleus particles are partially assimilated or dissolved into the primary melt to form more melt. Before complete melting is achieved, the sintering temperature drops due to the short residence time at the maximum temperature and then the melt solidifies and mineral phases precipitate, resulting in the formation of the bonding phases. During the sintering process, the chemical reactions are taking place at high temperature and the iron ore and fluxes are combined together and form a sinter cake composed of iron ore, silico-ferrites of calcium and aluminum (SFCA), dicalcium silicate and a glassy phase. Sintering reactions also regulate the volume fraction of each mineral which can affect sinter quality and hence, the performance of the BF. The first stage of sintering is granulation (nodulization or pelletization) of the sinter mix, which consists of its homogenization in a mixing drum for several minutes with the addition of 6 % to 8 % of water. The granulated sinter mix is then loaded onto the permeable sinter strand grate. The bed top is heated to high temperature by a gaseous fuel and air is drawn through the grate. After a short ignition time, heating of the bed top is stopped and a narrow combustion zone or flame front (FF) moves downwards through the bed, heating each bed layer successively. In the bed, the granules are heated to a temperature range of 1250 deg C to 1350 deg C for realizing their softening and then partial melting. In a series of reactions a semi-molten material is produced which, in subsequent cooling, crystallizes into several mineral phases of different chemical and morphological compositions. During the process of sintering, the combustion of coke generates a high temperature zone (combustion zone) which moves downwards through the sinter bed. Fine particles react faster, and form the primary melt which partially dissolves coarse ore particles. Schematic representation of sinter bed cross section of an interrupted sintering process is shown in Fig 1. 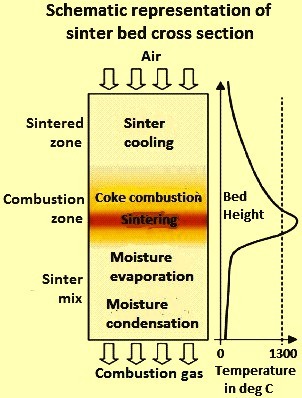 Progress of the coke combustion determines the temperature profile and the formation of different zones in the bed. As the combustion zone moves down, the solidification of melting phase occurs by air suction, resulting in the formation of the sintered zone. The zone below the combustion zone is composed of the sinter mix (un-reacted material) and can be split into two regions. The region immediately below the combustion zone corresponds to the dehydration of the sinter mix by the hot gas from the combustion zone, while the zone below this region is the cold part of the sinter bed where the steam is condensed. In principle, the sintering reactions involve reactions of fine ore with fluxes resulting in the formation of a melting phase which is used during solid-liquid reactions for the assimilation of the coarse ore. The melt which forms during sintering acts as the bonding phase. As SFCA is considered the most important component of the bonding phase due to its abundance in the sinter and its significant influence on sinter quality, sintering reactions have specifically been studied with regards to the control of the concentration and microstructure of the SFCA phase which forms during the sintering process. The volume of the melting phase plays a major role during sintering. Excessive melting results in a homogeneous glassy structure, which has a low reducibility, whereas a very low concentration of melting causes insufficient sinter strength, resulting in a high amount of return sinter fines. The process energy is supplied by combustion of the coke breeze. Ahead of the combustion zone, water evaporates and volatile substances are driven off. In the combustion zone, reactions take place resulting into the formation of a strong sinter. Most of the heat from the gases leaving the combustion zone is absorbed for drying, calcination and preheating of lower layers of the bed. When the combustion zone reaches the base of the bed, the process is complete and the hot sinter cake is tipped from the grate and roughly broken up in a hot crusher. Sintering is a continuous process. The sinter strand is formed by a series of pallets, each of the pellets has side walls and a permeable grate, which is loaded with the sinter mix, passes under the ignition hood, are subjected to downdraught suction, tipped, and then return to the loading position. The wind boxes below the strand are connected to a fan through a gas cleaning system. The sinter mix which forms the sinter bed consists mainly of iron ore, coke breeze, fluxes and return fines. The behaviour of the sinter mix during sintering and the quality of sinter is dependent largely on the chemical, granulometric, and mineralogical composition of the iron ore. The ore characteristics impact the sintering behaviour and hence it is an important aspect in sinter production. Various studies has been carried out on the influence of the sinter mix composition on sinter phases which has in turn impact on basicity (CaO/SiO2), temperature, thermal regime and Al2O3 (alumina) and MgO (magnesia) contents on the ferrites content, total hematite, reoxidized hematite oxidized from magnetite, reducibility index (RI), reduction degradation index (RDI) and tumbler index (TI), porosity and coke rate. The behaviour of sinter mix during the sintering process depends on its chemical composition. Several studies have been conducted in order to examine the effect of the chemical compositions of the sinter mix on melt formation and the assimilation reactions. Small changes in chemical composition of iron ore can induce significant modifications in phase formation during sintering. Sinter quality is dependent on the formation of the bonding phase which, in turn depends on the sintering ability of iron ore. On the other hand, the reactivity of iron ore is significantly influenced by its grain size which determines the reaction surface area and packing density (porosity) of the sinter mix. Hence, the particle size of the iron ore is important to control sintering reactions during the sintering process. The change in the ore particle size affects the sintering process. It has been found that the assimilation ability of fine ore particles is greater than that of coarse particles. The reaction surface area for fine particles is high resulting in high reaction rates. However, the formation of higher concentrations of melt can lead to the increase in the viscosity of the melt, resulting in a decrease in the melt fluidity. Hence, the inclusion of coarse particles into the sinter mix is necessary to improve the permeability of the sinter bed, which is associated with an increase in large-scale movements between the melt and solid particles. The iron ore mean particle size affects the permeability of the sinter bed, which in turn, influences sinter microstructure and productivity. The larger particles favour diffusion bonding, and smaller articles favour slag bonding in the sintering process. A high fraction of small particles forms excessive amounts of melt, resulting in a deterioration of the sinter quality, while the sinter from large amounts of coarse particles results in a decrease in the sinter strength. It has been found that the increase in iron ore mean particle size increased the sinter productivity. During a study of the sinterability of the sinter bed in which large particles are incorporated, it has been found that the use of larger ore particles results in improved permeability of the sinter bed as well as the sintering reactions during the process. When large particles are placed in the bed, low-density areas are formed around the particles. Due to the increase in permeability of the sinter bed, the gas flow rate as well as the FF speed is higher around the large particles than with fine particles. Hence, the melt reaction and the assimilation can occur quickly around the large particles due to the high fluidity of the melt. The particle size distribution also has effect on the packing density of compacted pellets, which influences sintering rates. The packing density of mixtures consisting of fine particles improves by replacing some of them by coarse particles. During compaction, the solid particles can move closer together, resulting in a high number of contacts between particles and a high packing density (low porosity). The replacement of fine particles by large particles leads to an increase in the packing density up to a maximum, after which it decreases for higher fractions of coarse particles. The maximum packing density occurs at the point where all the voids between the coarse particles are filled by small particles. The presence of coarse particles can therefore produce compacted powders with a higher packing density (lower porosity), resulting in an increase in sintering rates. The ultra-fines content in an ore blend, particularly the minus 50 micro metres (micron) fines fraction, play a vital role in granulation, firstly in initiating the formation of a coating layer around the nucleus particles and then in binding together the larger-sized adhering fines with the coating. Coke is the best fuel for iron ore sintering. Size classification is a crucial factor. The best economy and efficiency is achieved with a coke particle size of less than 3 mm. Some studies have shown that the best coke size for sinter productivity and reducibility is between 0.25 mm and 3 mm. Another study has shown that although a coke size of less than 0.25 mm has a negative effect on productivity; it does not affect the efficiency of the combustion process. Further, the coarser fraction is preferable and is more economical in terms of consumption. Comparison of different coke breeze size fractions has shown that better results are achieved with coarse coke (less than 3 mm and greater than 1 mm) than with fine coke (less than 1 mm). Fine coke is considered mainly as adherent fines in granulation which forms the surface coating around the grains. Fine coke burns quickly, while coarse coke burns more slowly and can widen the FF, leading to a possible loss of productivity. Also, a coarser fuel is more economical, reinforces sinter production, improves RDI and lowers SO2 emissions. The effect of the coke particle size in the sinter bed on productivity, coke consumption and sinter quality has been studied in sinter-pot tests. These tests have shown that the coarser coke breeze fraction leads to a higher FF speed and better combustion efficiency. Fine coke achieves poorer combustion efficiency, producing less heat and lowering the sintering temperature. As a result, the coke rate needs to be increased when finer coke is used in order to maintain sinter quality. The aim of granulation is to make the fine particles adhere to each other and form coarser particles. As a result the granulated ore contains a smaller range of particle sizes, and consequently offers less resistance to the passage of the gases. Granulation is of basic importance for the sintering of iron ore, as good sinter bed permeability largely determines the rate at which the process progresses and hence the productivity of the sinter plant. The granulation of the sinter mix is generally carried out in a rotary drum prior to the sintering process, for several minutes with the addition of 6 % to 8 % of water. The complete granulation process takes a time of around 30 minutes to 1 hour, including the addition of moisture, granulation and insertion in the sintering machine. The initial studies on the structure of granulated sinter mixes were carried out at Nippon Steel Corporation (NSC). 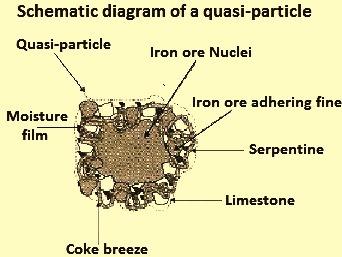 These studies have coined the term ‘quasi-particle’ also sometimes called pseudo-particle (Fig 2), which is composed of an iron ore nucleus. During sintering, this quasi-particle remains partially unmelted, surrounded by finer ore grains with silica (SiO2) gangue and in the presence of high basicity (CaO/SiO2). During the process of granulation, quasi-particles are formed when the fine particles (less than 0.2 mm) adhere onto the surface of large particles (greater than 0.7 mm) and then form granules. Intermediate particles (0.2 mm to 0.7 mm) are difficult to granulate and do not have a well-defined role. In practice, the amount of intermediate particles needs to be minimized because of their detrimental influence on granulation and adverse effect on permeability of the sinter bed. An increase in water content of the sinter mix can lead the intermediate particles to act as adhering fines, which poorly adhere onto the coarse particles, and can detach during the drying stage. The intermediate particles can also act as nuclei and form quasi-particles with small size compared to those formed with coarser nuclei. This can sensibly reduce the permeability of the sinter bed as well as the productivity of the sintering process. During the sintering process, ferrites form in the layer adhered to the nucleus due to the solid-liquid reaction between hematite and a CaO-Fe2O3 melt containing small amounts of SiO2 and Al2O3. Adhesion is highly influenced by the moisture available for granulation. Other factors such as the nature of the nucleus, particle shape and surface properties are of secondary importance. The moisture content in the sinter mix to be sintered is a very important parameter in the granulation process. The process of adhering fine particles to nuclei to form quasi-particles is very strongly influenced by the moisture available for granulation (total moisture minus moisture absorbed by sinter feed components). Maximum production is achieved with the optimum moisture addition, which is less than that needed for maximum air permeability. It is normal to operate at around 0.85 times than that needed for the maximum permeability. This is because moisture condenses in the bottom layer of the bed after evaporating from the upper part as the FF approaches. Condensation normally takes place during the first 2 minutes of sintering before the sinter mix reaches its dew point temperature. Good control of moisture addition is essential. Water addition in the mixing drum is required to be adjusted to maintain the set moisture level. Automatic control is desired to manual methods since it assures a more rapid response and more consistent feed to the sinter strand. Granulation which is carried out by rolling of the materials in a rotating drum, increases the granule size by adhesion due essentially to the action of two types of forces namely (i) ‘interlocking’ of the particles, and (ii) attraction by the creation of liquid phase ‘bridges’ between the particles. The importance of the magnitude of interlocking forces can be varied by altering the sequence of formation of the mix to be sintered so as to favour the aggregating action of the granulation nucleus provided by a given component (e.g. the return sinter fines). The magnitude of the interlocking forces can also be varied by modifying the sinter mix formation sequence to include a selective granulation or pre-agglomeration process. In such cases this involves treating the ore fines and concentrates, some return sinter fines and lime separately using an additional process line. These materials are mixed with water and micro-pelletized in a drum or disc before being introduced in the main granulation circuit prior to the granulating drum. In this process the return sinter fines act as the nucleus and lime acts as the agglomerating agent. This practice allows the use of a greater amount of fines with no loss of productivity. Forces of the latter kind (bridges) are originated by the presence of water added to the mix, and their effect can be increased by the use of additives. In both cases (interlocking and bridges) the strength of the granulated particles is not high. It is only sufficient to ensure that the granulated mix can be transported and layered on the sinter grate without breaking. The size distribution of a granulated mix when it is fed onto the sinter grate ranges from around 1 mm to 10 mm. The study to find out the structure of the granules in the three dimensional images, is generally done by using the 3D X-ray tomography technique. In one such study mixtures of iron ore fines (concentrates), return sinter fines and limestone have been prepared at concentrate/ore ratios of 20:80, 50:50, 80:20 and 100:0 and sinters have been produced with basicities of 0.8, 1.4 and 2.0. Incorporating increased amounts of concentrates in the sinter mix has made granulation more complex. Superfine particles not only adhere to coarse particles but can also form durable nuclei while binding particles of intermediate size, and the more super-fines are used in the sinter mix, the less predictable is the size distribution of the granules. Granules belonging to the sinter mix without coarse ore (concentrate/ore ratio of 100:0) had no nucleus and very few limestone particles stick to the surface which is initially formed by the pelletizing mechanism, and presents a similar structure to that of pellets. Granulating behaviour cannot be fully explained by any one single factor, such as the concentrate/ore ratio, and changes in the ore mineralogy, composition and amount of gangue, heat consumption and water content in the mix, all are being very relevant factors. Sinter productivity is directly related with bed permeability. In turn, permeability is related with the granule size distribution and average granule size, which are dependent upon the moisture addition. Permeability rises to a maximum value as a function of the moisture. Maximum productivity is obtained using 85 % of the moisture required for maximum permeability due to the condensation of moisture in the bottom layer of the bed. In some of the studies which have been carried out for predicting the granulation behaviour of a number of iron ores of different natures, have suggested an equation to calculate the optimum moisture of the raw mix as a function of the nature, composition and granulometry of the ores. The optimum moisture content is defined as the lowest amount necessary to achieve maximum bed permeability. The equation is applied for each ore and ore mix, with the addition of coke, flux and return sinter fines. Good correlation has been found between experimental and calculated values. In some other studies on granulation, equipment has been designed to determine the moisture capacity of several types of iron ores and ore mixes. The moisture capacity has been defined as the maximum water content which can be retained between ore particles. It has been seen that the moisture capacity increases in line with the external surface area and decreases as the ore pore volume rises. The equation to determine the ratio between the optimum moisture (W) and moisture capacity (MC) which has been found is W = 6.94 + 0.12 MC. The experimental data has indicated a very high correlation between W and MC. Based on further studies as well as initial studies, the equation which has been proposed for calculating the optimum moisture (W) as a function of the nature, composition and granulometry of the iron ore is W = 2.28 + 0.427 L + 0.810 A – 0.339S + 0.104D + 0.036 E where L is the ore weight loss during heating in grams, A is % Al2O3 in ore, S is % SiO2 in ore, D is ore size fraction less than 0.2 mm, and E is the ore size fraction between 0.2 mm and 1 mm. It has been established that a sample with a higher moisture capacity requires higher water content for achieving the best bed permeability. It has not been possible to directly relate permeability with the nature of the ore.
Studies have also been carried out to determine the effect of moisture addition and wettability on granulation by determining the contact angle between iron oxide and water and the iron ore granulation fitness. The study considered different types of ores to determine interaction between various parameters namely (i) nature of ore (porosity), (ii) moisture content, (iii) wettability time, (iv) measurement of ore-water contact angle, (v) surface roughness, (vi) rpm of pelletizing drum, (vii) adherent fine ratio (AR) of fine particles , and (viii) fracture strength (FS) of quasi-particles. The best granulation is achieved with a goethite ore nucleus, with high porosity, low roughness and a low contact angle (more wetted). Two stage granulation systems have also been used in some sintering plants. The two stage granulation system helps in treating of fine ores while increasing the FF speed, permeability and productivity of the process. It is advantageous to improve the conventional granulation process, especially when using goethite and limonite ores which usually present a higher Al2O3 content than hematite ore and lead to deterioration of sinter properties. In this respect, studies have shown that sinter quality improves when the conventional granulation stage in the drum mixer is followed by a second stage. In the first stage the mix of iron ore and return sinter fines is placed in the drum. In the second stage, coke plus limestone plus dolomite is added to the mix resulting from the first stage and the granule obtained is formed by a nucleus composed mostly of iron ore surrounded by coke and flux. This coating granulation process improves the flux formation reaction due to the segregation of CaO (calcium oxide) from the limestone on Fe (iron) from the iron ore. This result into sintering taking place at a lower temperature, improves permeability and productivity, and decreases the formation of secondary hematite, with the consequent improvement in the RDI. The TI and reducibility also improve, due to the formation of more micro-pores, which also prevent the propagation of cracks responsible for deterioration of the RDI. The mixing time in the drum in the second stage is very important, and around 50 seconds has been established as the optimum time. A shorter time does not allow the nucleus to become well coated with coke + flux. A longer time causes destruction of the quasi-particles, due to the inclusion of coke and flux in the granules (of the nucleus), and yields a similar quasi-particle to that obtained in single-stage conventional granulation. Detailed studies have been carried out carried out on the coke and limestone coating granulation method with the aim of improving productivity, reducibility and BF operation. This technology consists of coating coke and limestone on the surface of quasi-particles which have been granulated in the primary part of the drum mixer. Coke and limestone are injected from the end of the drum mixer by the belt conveyor at high speed to achieve their coating on the quasi-particles. The coating granulation time is the most important control factor and is adjusted by changing the conveyor speed. The normal time is in the range of 40 seconds to 60 seconds with shorter times not all the quasi-particle is coated, and with longer times the quasi-particle is destroyed. Studies have also been carried out to assess the segregation of particles granulated separately (coke coating and limestone coating), and in both the cases of the granulations, productivity has been seen to rise compared to conventional productivity. Coke coating improves the cohesion stress of quasi-particles and thus improves permeability in the wet zone. With limestone coating the sinter presents a lower secondary hematite content and a structure with crack tolerance (improved RDI), more primary hematite and SFCA (improved RI), and improved melt fluidity. In the BF, shaft efficiency improves by 1 %, and the reducing agent rate can be lowered by 7 kg/ton of hot metal. Selective granulation technology is also being used in some of the sintering plants in Japan. This technology is used to allow the sintering of iron ore with high Al2O3 content, which is otherwise difficult to sinter due to the low reactivity of Al2O3 bearing materials and the high viscosity of primary melts. Selective granulation consists of screening the ore and sending the larger size fraction which has a lower Al2O3 content to the conventional granulation circuit, while the smaller size fraction with a higher Al2O3 content is pelletized into granules of size 2 mm to 5 mm which are incorporated in the conventional granulation circuit. The smaller size fraction contains clayish ores which are high in Al2O3 and require higher melting temperatures. The selective granulation achieves a granule nucleus with higher Al2O3 content than conventional granulation. With this process, the fines adhered to the nucleus with a lower Al2O3 content by reacting with the limestone promote the formation of the primary melt at a lower temperature. The selective granulation process has a high raw materials processing rate, and can process sticky raw materials continuously. Further, a fuel coke reduction and a blower power reduction are achieved. Also, productivity is improved and the FeO content is reduced. The improvement of reducibility in turn leads to a reduction in coke consumption in the BF. There is also improvement in the RDI value of the sinter. Flame front or combustion zone temperature has a very large impact on sintering time and productivity since it has influence on FF permeability. Generally the reducing of the FF temperature is very beneficial to productivity since the resistance of the FF to airflow is a function of gas velocity to the power of three. Raising the FF temperature significantly increases airflow resistance and leads to increased sintering time and reduced productivity. Measuring of the temperature at different levels in the sinter bed allows the movement of the combustion zone to be monitored and the concept of the FF speed to be defined as the rate at which the level where the fastest temperature rise takes place moves through the bed. 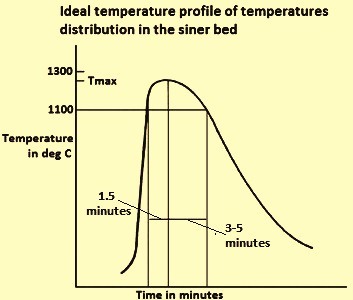 Fig 3 shows the ideal temperature (heat) distribution in the sinter bed. The heating time in the high temperature zone (higher than 1100 deg C) needs to be short (1.5 minutes) since the partial oxygen pressure measure (pO2) in this zone is low due to coke combustion and FeO, which is harmful to sinter reducibility, is easily formed. The cooling time (to 1100 deg C) needs to be long (from 3 minutes to 5 minutes) in order to achieve a strong sinter structure by the formation of a gangue matrix, which is favoured with the presence of SiO2 (silica). Time-temperature profiles have been measured in several positions in the bed, and indicate that the width and Tmax of the combustion zone increase as it drops through the bed. In order to achieve a uniform Tmax, two layers sintering is carried out in some sinter plants. It consists of preparing the bed with higher coke content in the upper layer than in the lower layer in order to counter the tendency of Tmax to rise. In addition to two layers to control heat distribution in the bed, continuous measuring equipment has been developed which directly signals the temperature distribution throughout the bed, along with a device to measure the distribution of the volume sucked through the sinter grate. The heat distribution can be controlled by adapting the strand speed and the coke content in the sinter mix. There is a relation between maximum FF temperature and sinter structure. When sintering is carried out at a temperature below 1300 deg C, at around 1200 deg C a melt (consisting mainly of Fe2O3 and CaO) is generated in the sintering bed, and the iron oxide and fine particles are assimilated in the melt. 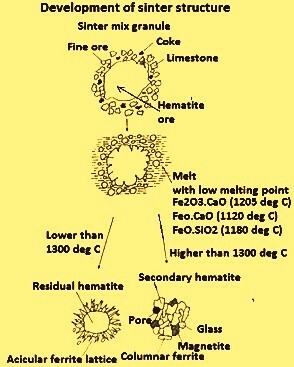 If the melt penetrates the hematite grain, interfacial breakdown occurs, leaving a primary hematite (unmelted) which is considered beneficial for sintering since it improves the RI. When CaO and Al2O3 are assimilated in the melt, this reacts with the iron oxide and generates acicular calcium ferrite (of a size of less than 10 microns) containing Al2O3 and SiO2 as solid dissolutions, according to the general reaction Fe2O3 + CaO + SiO2 + Al2O3 ? SiO2·CaO·(Fe, Al)2O3. The silico-ferrite of calcium and aluminum (SFCA) is considered very beneficial component for the sinter structure since it possess good reducibility and imparts the sinter mechanical strength, and improves the shatter index (SI) and tumbler index (TI). During the sintering at low temperature (less than 1300 deg C) the formation of magnetite decreases (less FeO) and sintering improves the RI and lowers (improves) the RDI. Also, the optimum structure for sinter reducibility in the BF is achieved, which gets formed by a hematite nucleus (unmelted) surrounded by an acicular ferrite lattice. When sintering at a temperature higher than 1300 deg C, part of the ferrite dissolves and melts to become converted into hematite or magnetite and into gangue components. When the melt cools it forms as new phases of (i) large ferrite crystals, whose reducibility is inferior to the acicular ferrite, and (ii) secondary hematite, which is detrimental to the RDI. Fig 4 illustrates schematically the development of the different structures of sinter as a function of the Tmax reached in the bed. Tab 1 shows the variance of the phase composition and sinter quality indices as a function of the temperature Tmax. The best results are obtained in the temperature of around 1250 deg C, with a maximum percentage of ferrites, high primary hematite, low secondary hematite, good porosity, and good quality indices (FeO, RDI, RI and SI). The BF operation is dependent upon the geometry and condition of the cohesive zone, which is limited by the softening (ST) and melting (FT) isotherms. The cohesive zone is constituted by alternate layers of soft sinter and coke. The latter (known as ‘coke window’) allows the reducing gas to pass through to the BF shaft. Hence, it is important for the cohesive zone to be as narrow as possible, in order to facilitate the penetration of the reducing gas, and as low as possible in the BF, so that the furnace preparation zone above the cohesive zone is sufficiently large to allow the reduction of iron oxides. In order to fulfill both conditions the ST and FT is to be as high as possible and the difference between them is to be minimal. Part of coke consumption saving in BF takes place due to the improved sinter quality, in particular its reducibility and high temperature properties. Several studies have been carried out into the fundamental mechanism underlying the softening and melting of the sinter in the BF. The sequence which takes place during softening and melting consists of (i) pre-softening, (ii) softening, (iii) exudation, and (iv) dripping stage. The softening mechanism is related with the melting rate of the core as a function of the temperature. Deformation is considered to be directly related with the macro-porosity generated by the transfer of melt from the core to the outer layer. Initial melt formation plays a role in the start of softening, reduction, retardation and dripping of melt from the bed. In one of the studies in an experimental unit which reaches a maximum temperature of 1400 deg C, the softening and melting of sinters has been determined for different basicities (range 1.5 to 3.0), MgO contents (range 3.3 % to 10 %) and many sinter reducibility grades. The softening-melting range has been defined as the temperature range between the point of reversal (T1 softening) and 10 % contraction (T2 melting). It has been noticed that the behaviour of BF improves (lower and narrower cohesive zone) as the sinter/ore ratio in the BF charge increases. Another study done for finding the effect of the FeO content in sinter (sinter type A 10 % and sinter type B 12 %) on softening and melting, and its impact on the BF working. The sinter with more FeO caused early softening of the burden, a phenomenon which is undesirable in the BF. Unreduced FeO is reduced at a higher temperature, according to the equation FeO + C = Fe + CO, and such direct reduction in a higher amount leads to a higher coke rate in the process. A lower wind volume, production and productivity have also been noticed in comparison with the behaviour of BF when operating with a sinter load with 10 % FeO. A drop in the MgO content in sinter from 1.75 % to 1.5 % gives rise to changes in furnace behaviour which is attributed to variations in the softening and melting temperatures. Another study has been carried out to find the influence of the material composition on softening and melting properties in the BF burden materials. The experimental part has been carried out in a unit which simulates BF environment, operating under load up to a temperature of 1580 deg C. Sinter showed a high softening temperature (around 1400 deg C) but a relatively low meltdown ratio and poor high temperature permeability. An increase in sinter basicity has been seen to be detrimental to the fluidity of melted slag and iron in the BF, resulting in more melted slag and iron being blocked in the coke layer, thus decreasing the percent meltdown and increasing the gas resistance of the sample bed. For this reason it is important to lower the sinter basicity. On the other hand, an increase in Al2O3 (range from 0.9 % to 2.6%) or MgO lowered the slag melting point, thus favouring a reduction in high temperature gas resistance. Sinter presents better softening and melting behaviour than pellets or ore, but worse meltdown and high temperature gas resistance. It has been seen that a mixed burden containing 65 % sinter, 20 % lump ore, and 15 % pellets is slightly better than other compositions in terms of FT and ST, meltdown and high temperature gas resistance. 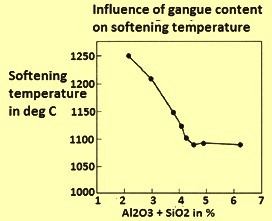 In an another study it has been found that the softening temperature comes down as the gangue content in the ore increases, due to the fact that gangue forms compounds with low melting point such as 2FeO·SiO2, FeO·SiO2·CaO, and Fe2O3·SiO2·CaO (Fig 5). The alkalis contained in gangue can also form compounds with a low melting point such as Na2SiO3, K2SiO3, and NaAlSi2O6. The softening temperature of the sinters produced at temperatures between 1300 deg and 1350 deg C depends on the composition and mineralogy of the sinter. The permeability resistance K of the sinter bed is generally evaluated by the sinter softening property test. When K is plotted against the bed temperature, integrating the curve obtained in the 1000 deg C to 1600 deg C interval, the KS bed resistance parameter when calculated, it has been found that a reduction in the SiO2 content and an increase in MgO in sinter improves both its permeability (lower KS) and the sinter softening property. The action of SiO2 is due to a decrease in the melt which fills the voids in the bed. The action of MgO is due to an increase in the melting point of CaO-FeO-SiO2 slag. The Al2O3 content has little effect on the sinter softening property. In another study, it has been found that as the sinter is improved when the Al2O3 content is decreased from 1.8 % to 1.5 %, the sinter has better reduction and softening-melting in the BF. Also the permeability resistance index in the cohesive zone is improved. This may be due to the amount of melt having low melting point being little owing to the improved reduction efficiency and lower Al2O3 content. The softening and melting behaviour of three lump hematite ores and a sinter has been determined in an outfit which operates under load. It has been found that the beds of lump ores contract much earlier than sinter by the formation of fayalite, with a low melting temperature component to be around 1175 deg C to 1205 deg C. No fayalite forms in sinter and at higher temperature melts which are generated appear to be more viscous, resulting in less bed deformation. There is not an appreciable difference for the softening and melting temperatures for sinter and for 80 % sinter and 20 % lump ore blend. With this blend as ferrous burden in the BF, the permeability remained in the normal operating range, the same that when the BF operate with 100 % sinter, with no indication of non-uniform gas flow conditions or abnormal cohesive zone issues and gas utilization efficiency even improved slightly. An important property of melts is that they coalesce, transforming the uniformly packed bed of granules into sinter particles and very large channels in the bed. The coalescing behaviour of melts needs to have a favourable influence on the flame front properties in determining the permeability of the sinter bed. During the sintering process, several chemical reactions between iron ores and fluxes are taking place at a specific maximum temperature, resulting in conversion of loose materials into a solid mass. These reactions are defined as sintering reactions and involve the formation of the melting phase followed by the assimilation of large particles into the melt. Studies have been carried out regarding the sequence of formation of phases during iron ore sintering (Fig 6). These studies found that the sintering reactions occurred in the FF and consisted of reactions between a fraction of iron ore and the principal flux. This led to the formation of a liquid phase which formed the bonding phase. It has also been that the sintering reactions start within the layer of adhering fines where fine reactive ores and fluxes are in intimate contact. Hence, solid – solid reactions are the first reactions to occur, generating the primary melt. However, large particles are almost inactive during this first stage due to their large reaction area. The sintering reactions consist of melt formation and assimilation reactions (Fig 7). A relevant starting point was a pseudo-particle consisting of a large core particle (nucleus) and a coating layer of adhering fines and fluxes. Fig 7 (i) represent the basic structure of pseudo-particles formed during the granulation. The sintering reactions begin within the layer of adhering fines, where fine materials are in intimate contact. With the increase in temperature (at about 1100 deg C), calcium ferrites are the first product to form by solid-solid reactions between hematite and lime. At around 1200 deg C, calcium ferrites decompose and form the initial liquid melt, which can dissolve SiO2 and Al2O3. This stage of the sintering process is schematically represented in Fig 7 (ii). As the sintering process progresses, the liquid melt starts reacting with the nucleus particles, resulting in a dissolution of the nucleus particle and formation of more melt as shown in Fig 7 (iii). The assimilation reaction depends on the properties of both the initial melt and nucleus particle. The more reactive is the melt, the greater is its ability to dissolve the solid nucleus. Similarly, the greater is the reactivity of the solid nucleus, the more is the amount which gets assimilated. In principle, the sintering reactions involve reactions of fine ores with fluxes resulting in the formation of a melting phase which is used during solid-liquid reactions for the assimilation of coarse ore. The melt which forms during sintering acts as the bonding phase. During the sintering process, the formation of the melt occurs in the FF where the temperature is higher than 1100 deg C. Then, the melt solidifies to become the bonding phases which make up the majority of other phases within a sinter. The bonding phase is generally consists of the SFCA phase in association with iron oxides and silicates. SFCA is considered to be the most important bonding phase because of its great influence on the properties of sinter. In the process of sintering the temperature of the sinter mix is increased to achieve its partial melting and to produce a molten material which, during cooling, crystallizes or solidifies into several mineral phases which agglomerate the structure as a whole. The energy for this process is supplied by burning of the coke breeze. A study to determine the sequence of reactions in SFCA formation has been carried out using a combination of XRD (X-ray diffraction), DTA (differential thermal analysis), and EPMA (electron probe micro analyzer). The first ferrites formation reactions are solid-solid reactions which start in the temperature range of 750 deg C to 780 deg C and end at 1200 deg C, the melting temperature of these ferrites, following the sequence dicalcium ferrite (C2F) to calcium ferrite (CF) to calcium diferrite (CF2) (Fig 6) as per the following equations. CaO plays an extremely important role during sintering as it combines easily with Fe oxides in the mix to produce calcium ferrites. The melt formation reaction starts at the point of contact between the ore fines and CaO. At the same time, the solid-solid SFCA formation reaction starts at around 1050 deg C and continues in a solid-liquid reaction above 1200 deg C. The presence of Al2O3 increases the stability of SFCA, and lowers the temperature at which these ferrites start to form. Above 1200 deg C, solid-liquid (solid-melt) reactions predominate, with the presence of a molten phase which reinforces the assimilation of material to form ferrite as per the following equation. 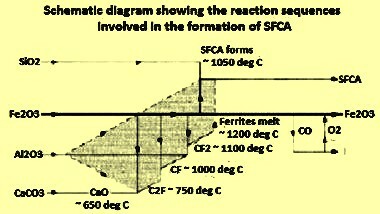 The sequence of SFCA formation reactions is shown in the schematic diagram (Fig 5). Al2O3 is highly reactive and enters the solid dissolution with the C2F, CF and CF2 phases, as indicated in the shaded region of Fig 5. In this study it has been also seen that SiO2 does not react with Fe2O3 or CaO and remains inert until SFCA start to form at temperatures higher than 1050 deg C.
Study has also been done on the formation of 2CaO·Fe2O3 at 1000 deg C from a stoichiometric mixture of Fe2O3 (Fe ore) and CaCO3 (lime stone). Fe2O3 is reduced to Fe3O4 and FeO before the calcination of limestone starts, as a function of the partial pressure of O2, which is determined according to the CO content in the CO+CO2 reducing mixture. The order which is found for the reaction rate of Fe oxide with CaO, for the formation of dicalcium ferrite is FeO -> Fe3O4 -> Fe2O3. Throughout the process, the Fe oxide can simultaneously be reduced by CO produced in the partial combustion of coke-coal as per the following equation. Fe3O4 can oxidize to Fe2O3. FeO can oxidize to Fe3O4 or Fe2O3, and can initiate with outside energy, low melting point following slag formation reactions. Silica from the iron ore can react with the molten ferrite as per the following equation to form calcium silicates and precipitate hematite or magnetite, depending on the pO2 in the reaction system, together with the silicate formed. The sequence of reactions shown above has been widely studied due to its importance in sintering. In one of the study calcium ferrite (CF) samples and CF + Al2O3 and CF + SiO2 samples have been sintered. It has been shown that the addition of Al2O3 is more effective to dissolve the hematite in CF, and the addition of SiO2 is more effective to raise the CF formation rate. CF2 and CF2 + Al2O3 (3 % to 9 %) + SiO2 (1 % to 7 %) samples have been sintered to prepare SFCA, monitoring the evolution of these processes by XRD. Al2O3 solubility in CF2 at 1250 deg C is 5 % -7 % and SiO2 solubility is 2 % to 4 %. Monoclinic structure CF2 changes to triclinic when it reacts with Al2O3 and SiO2 to form SFCA. The addition of SiO2 at 1200 deg C causes partial decomposition of CF2 into calcium silicates. As the Al2O3/SiO2 ratio increases, formation of hematite decreases and SFCA formation increases. The Fe3+ ion (radius 0.65 angstrom) in tetrahedral centres is replaced by smaller ions (Si4+, 0.40 angstrom and Al3+, 0.54 angstrom), in such a way that the unit cell volume tends to decrease as more Si4+ and Al3+ are added to the CF2.